After visiting the Lollipoppe Shoppe web site I've finally learned that SLOTERDIJK is a Dutch word meaning "endpoint". I missed my one opportunity to date to hear SLOTERDIJK perform when I succumbed to fatigue at midnight during Strange Daze '99, the band's performance not beginning until around 2:30am I believe. A bit of history on the SLOTERDIJK web site indicates that Mike Burro started the band as a solo project in 1996 playing Dutch trance music, with additional members, including guitar, coming later. 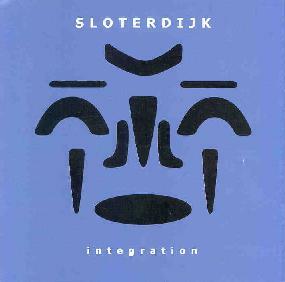 For Integration, Burro has compiled studio and live tracks, some of which were recorded on SLOTERDIJK's 1999 German tour. This... my friends... is pure heavy psychedelic Hawkwind inspired spacerock. We cover a lot of territory here at Aural Innovations, but I seem to get less and less of this brand of spacerock as time goes on so Integration has been a real pleasure. The keyboard/guitar interplay throughout the disc will bring a warm knowing smile to the face of spacerockers everywhere. Pounding percussion lays the groundwork for the keyboard excursions and screaming guitar workouts. And there are lots of lengthy jams held together by the songs. Burro's vocal style includes both singing and monologing, often with a Sonic Attack feel as heard at the beginning of the title track and on "Cryogenics". Some of the more purely psychedelic moments on Integration are when the organ and guitar gang up on the listener for two-pronged aural assaults. In fact, the prominence of Burro's organ made for some of my favorite moments, a highlight being "Le Guide". "Fred Goldman's Moustache" is a little different, being a space trancey tune, but highly dark and freaky, perhaps reminiscent of the earlier SLOTERDIJK music. Much of Integration reminded me of Krel, due to the pounding tribal percussion, and keyboard/guitar style, though the SLOTERDIJK guitar kicks out more piercing solos than I've heard from Krel. But I think that's a fairly good reference point other than Hawkwind themselves. Though I missed SLOTERDIJK at Strange Daze '99, it's more than likely the opportunity will arise again soon. Burro promotes himself more aggressively than most spacerockers, the result having been a fair number of performances, several of which have brought him to Europe, and more in the works. If you're yearning for Hawkwind styled spacerock, then I think you'll dig Integration. Integration is distributed by Lollipoppe Shop Records. You can visit their web site. You can visit SLOTERDIJK at their web site.